Mackenzie Martin Crosley has been a part of the Dancescape community for many years, and in a variety of roles. We were first introduced to her as a performer; she then began presenting her own work as a choreographer; and finally, she emerged as a champion of dance education and entrepreneur, partnering with Cheshire Moon to offer Dancescape students scholarship opportunities with the touring Soul De Soul Dance Convention for which she served as Co-Founder and CEO. Having watched her career evolve over the last decade, the launch of her contemporary dance company — Geometry — in 2016 was a natural progression. She has developed her own unique voice as a choreographer, and the pieces that Geometry presented both domestically and at international festivals abroad were clearly steps toward building a larger, cohesive body of work. The presentation of “Amorphous” in 2018 was the company”s first full-length show, and proved a strong debut for the group. One of Mackenzie’s (many) strengths as a creator is her ability to create a sense of place, and the “Amorphous” premiere was no exception. The IAF Compound in Hollywood — a blank slate of a warehouse used by the creative community for everything from dance classes to photo shoots — was completely transformed into Geometry’s lair. 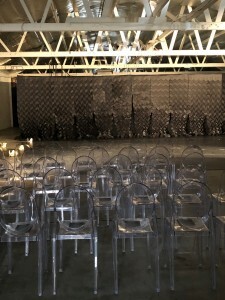 Rows of smooth, rounded clear chairs were juxtaposed against the angular, 3-Dimensional background that spanned the stage. Interestingly edited vignettes of the company forming and reforming a variety of shapes were projected onto large scenes framing each side of the audience, while fog machines wafted subtle clouds of haze through the air. Even though the marley “stage” was mere inches from the first row of chairs and lighting was minimal, the entire atmosphere felt intentional and exciting. The performance was an impressive collection of movement and performers, spanning just over an hour with no intermission. 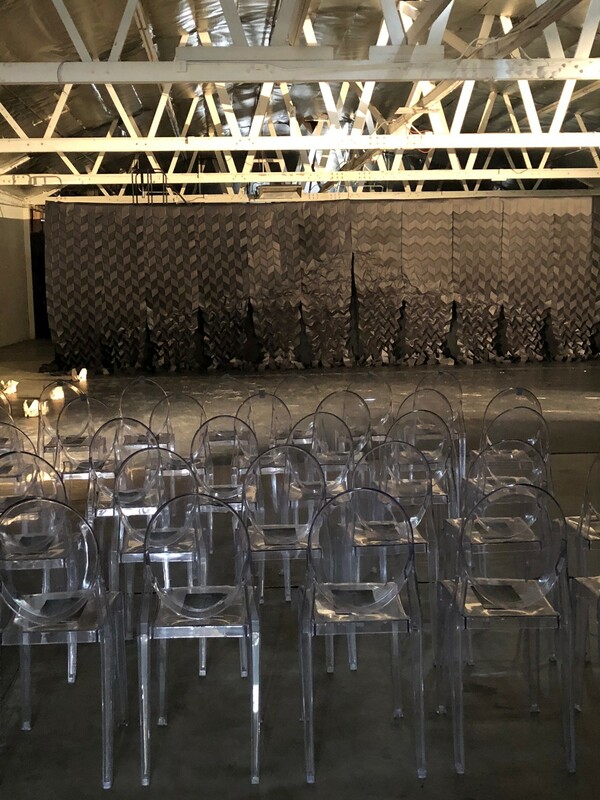 There was a clear distinction between each of the pieces, yet there were common threads woven throughout the show that nicely tied it all together. The work seemed to be more about conveying and evoking emotions, rather than develop a specific narrative or make a definitive statement. Musically, even the “pretty” songs had an underlying haunting, intense quality to them, adding to the emotional uncertainty of the experience. Viewing this type of work in such an intimate space has both pros and cons. 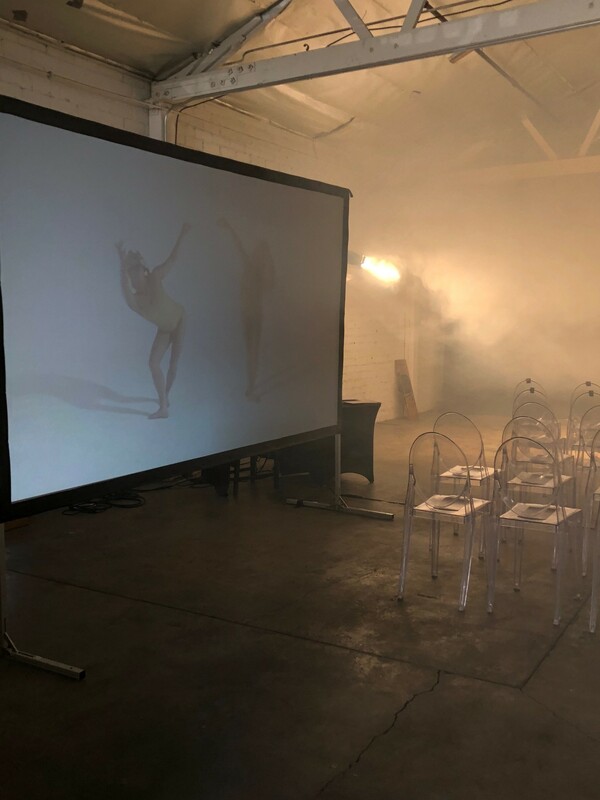 While for some pieces it elevated the emotional connection to the dancers, other moments would have benefited from being a bit more removed. The large group numbers especially were almost overwhelming to watch in such close proximity, and any out-of-sync moments were hard to miss. One of the elements of Mackenzie’s work that makes it so interesting to watch (and challenging to attempt) is the combination of intricate musicality and strange shapes; it shouldn’t seem like her movements should be able to connect fluidly, but the transitions are absolutely beautiful once they are in the dancers’ bodies. This also allows for each dancer to interpret these shapes and transitions slightly differently; while this is fascinating to watch in some of the pieces — especially in the more improvisational, and emotionally charged sets, the differences can prove distracting in the full company numbers, especially when unison is intended. This is certain to evolve and improve as the company matures and performs the repertoire more consistently. Standout numbers included “And We Run” closing the show, enjoyable not only for the uplifting score and jubilant choreography, but also impressive to watch the dancers do that much actual running so late in the performance, and “Otherside” a truly innovative ensemble piece incorporating chairs into what felt like could have easily been a group therapy session, as dancers strode forward, fell backward, created new pathways, forged and broke connections, found and lost hope again. Overall an exciting, thought-provoking and well produced debut. Looking forward to all of the shapes Mackenzie and Geometry will make in the future.